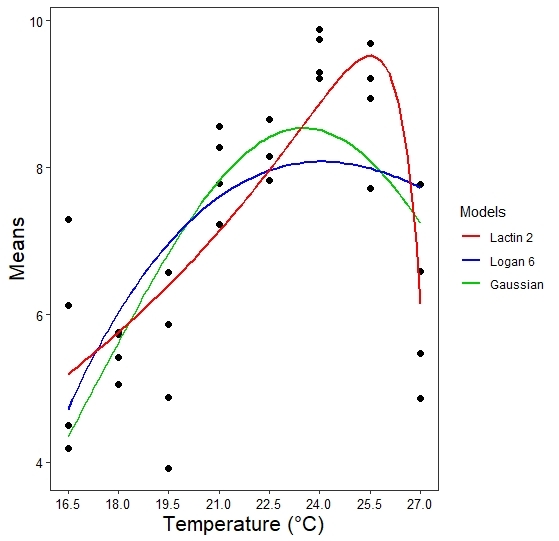 What are some left skewed models for curve fitting? I am working on some data on thermal performances on my organism for my thesis. I came across the Ricker Model which is a right skewed curve as shown below. How can I modify it to become a left skewed curve with a peak to the right hand side at higher x values. Hence, performance of the organisms slowly increases from at smaller x values until it hit an optimum, then decreases as x continues to increase. This is the general form to which my data conform, but I don't know much about models and equations to find one to would fit my data set and explains the biology observed. So far, I have been this coding below to fit my data. However, the initial increase is a little to abrupt compare to what is measured. Pointers, help, comments are extremely appreciated! Thank you. As you can see, visually the best fitting curve is the one produced by the Lactin 2 model, however, it has the highest AIC values and the peak occurred slightly later (25.5°C) than where I would like it to be (24°C). The Gaussian model has the best AIC value, but I don't know if it's peaking a little too early? Which model should I pick given the shape of fitting and the AIC values? If I should go for the Lactin 2 model, how can I change where the peak occurs? Not the answer you're looking for? Browse other questions tagged generalized-linear-model data-visualization model curve-fitting ggplot2 or ask your own question. 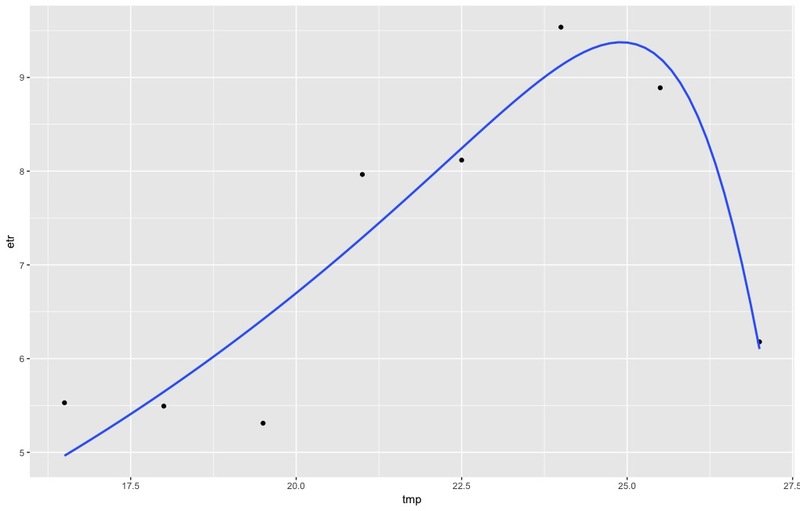 Curve fitting in R. L-shaped?